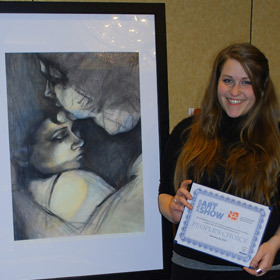 Lawrence University senior Sydney Pertl earned the Peoples’ Choice Award Feb. 25 in an art competition at the Self Employment in the Arts (SEA) Conference held at North Central College in Naperville, Ill.
A studio art major, Pertl was recognized for her work “Forever Ago,” a charcoal drawing on a watercolor background. It is one piece in a series and plays tribute to specific instances of the many people, strangers, acquaintances and friends, who, through their actions, caused Pertl to reconsider her entire system of beliefs and views of the world. Sydney Pertl '12 earned the Peoples’ Choice Award at the recent Self Employment in the Arts (SEA) Conference for her work "Forever Ago." The piece was one of 70 works submitted by university artists for a juried art exhibition. The Peoples’ Choice award was determined by votes from every attendee of the show, which included other student artists, professional artists and art educators. “It was so flattering for me to know that people related to my work and truly connected with it enough to vote for it, especially considering how wonderful the rest of the competition was,” said Pertl. “Forever Ago” premiered last year in the Rabbit Gallery, a “pop-up” gallery utilizing empty storefronts created by Lawrence students in an Entrepreneurship in the Arts course. The SEA conference also featured works by Lawrence seniors Anne Raccuglia, a studio art major, and Timeka Toussaint, a studio art and government double major. SEA Conferences join students and other aspiring artists with working artists, educators, and arts-business professionals. Interactive panels provide practical lessons about structuring careers, marketing, legal issues, accounting and more. Founded in 1847, Lawrence University uniquely integrates a college of liberal arts and sciences with a world-class conservatory of music, both devoted exclusively to undergraduate education. Ranked among America’s best colleges, it was selected for inclusion in the book “Colleges That Change Lives: 40 Schools That Will Change the Way You Think About College.” Individualized learning, the development of multiple interests and community engagement are central to the Lawrence experience. Lawrence draws its 1,445 students from 44 states and 35 countries. Follow us on Facebook.